David Solseth and the Eugene Emeralds had a good day in this August 1989 contest, according to The Eugene Register-Guard. The team picked up nine hits, four of them doubles. Solseth had one of those doubles and another hit, The Register-Guard wrote. "We've got a lot of guys who can hit," Solseth told The Register-Guard afterward. 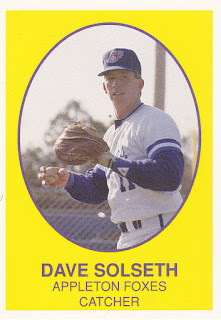 Solseth's own hitting took him to a .303 average that year, knocking six home runs over 62 games. But he couldn't keep up that pace. Solseth played just two more seasons as a pro. He never made AA. Solseth's career began in 1989, taken by the Royals in the 30th round of the draft out of Grand View College in Iowa. With Eugene, the catcher played well. He picked up two hits in a June game, both doubles. He then went 2 for 5 in a July win. One of those hits came in the ninth, Solseth knocking in the run that proved the difference, The Register-Guard wrote. Solseth hit one of his home runs, his second on the year, in a mid-July win. He also picked up two other hits in that game. For 1990, Solseth moved to single-A Appleton. He went 1 for 3 in a May game, hitting a single. Overall, he hit just .212 in 94 games. Solseth made high-A Baseball City in 1991 and moved to first base. He hit .235 there in 121 games there. That season, though, turned out to be his final season as a pro.